The Macaw Digital Marketing Analytics report provides the Marketing Manager and Product Owner a clear overview of the KPIs related to their Digital Marketing campaigns. The report loads its data from Google Analytics and refreshes frequently to make sure users always have an actual overview of their KPIs and the actions taken. The aim of this Digital Marketing Analytics report is to provide the Digital Marketing Managers and Product Owners a clear overview of the KPIs related to their Digital Marketing campaigns. The data source of this report is a Google Analytics Connector. 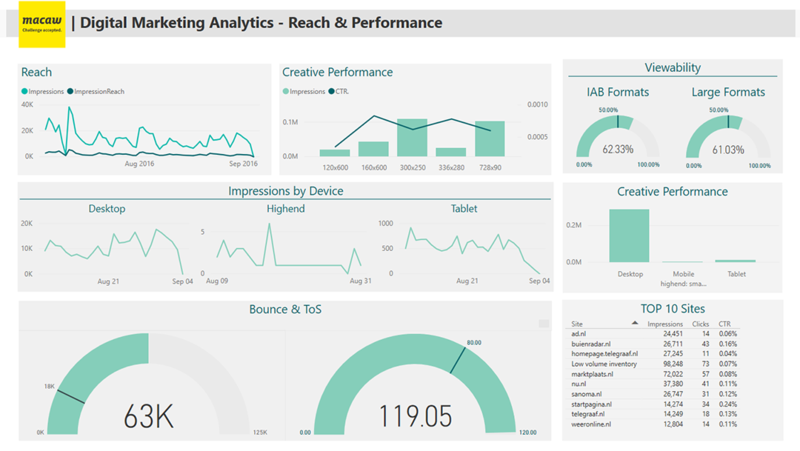 The dashboard refreshes frequently so stakeholders always have an actual overview of their KPIs and actions taken by the target group related of their campaigns. On this page an overview of the campaign clicks, impressions and (average) money spend per click is shown, allowing Stakeholders to get a clear overview of the costs related to their campaigns. Also clear visuals of KPIs CTR (click through ratio), Conversions and Bounce Rate are shown. 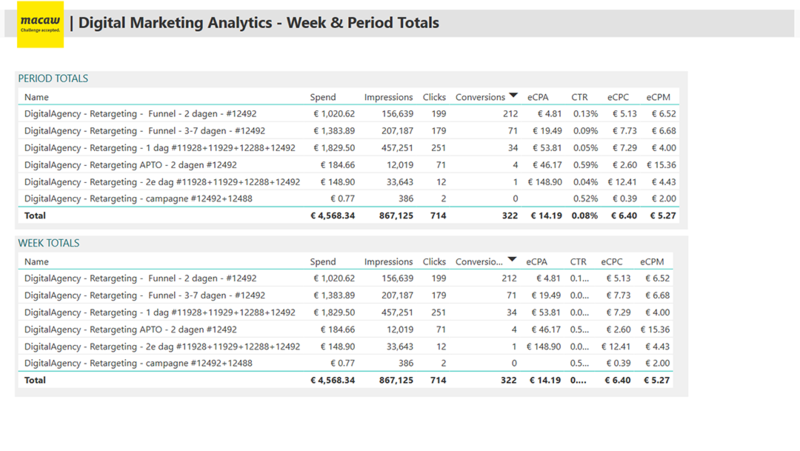 On this page a weekly overview of the campaign clicks, impressions and (average) money spend per click is shown on a weekly basis, with an option to select specific weeks. 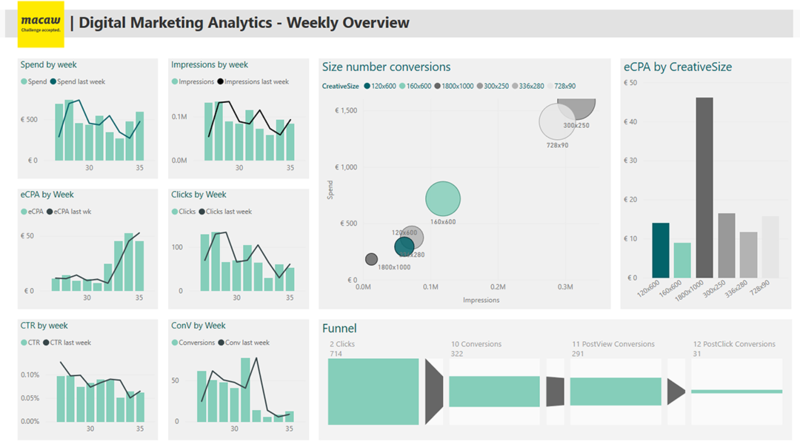 A horizontal funnel is provided for insights into the related behavior of the target group of the campaign. 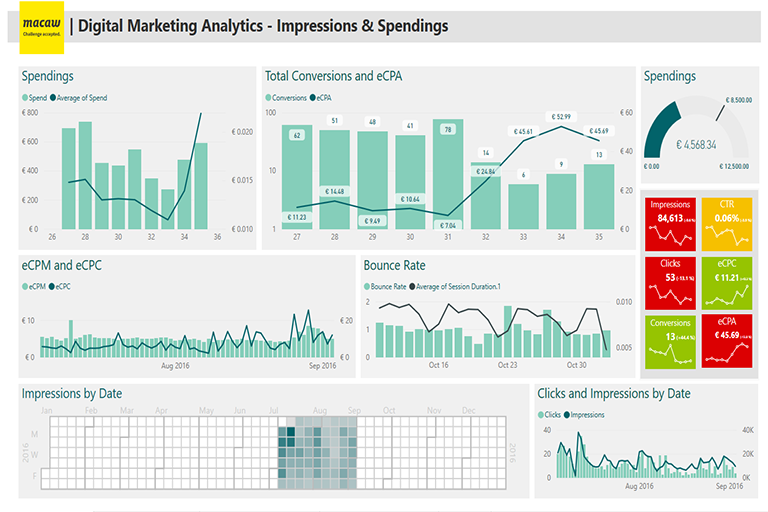 On this page an overview of the totals per period and week of the digital marketing campaigns are shown in a matrix view, allowing stakeholders to get a quick view of the most important KPIs. 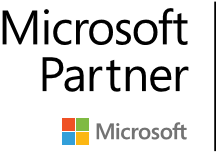 Power BI İş Ortağı olmak mı istiyorsunuz? Onaylı iş ortakları ekibin önemli bir parçasıdır! Yeni iş fırsatları yakalayın, bağlantılar kurun, şirketinizin yeteneklerini ve deneyimini dünya çapındaki Power BI kullanıcılarıyla paylaşın.